Promoting good-paying, family-sustaining jobs is a key priority for my House Republican colleagues and me. 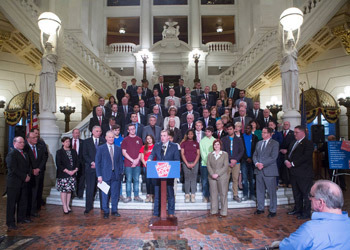 This week, I stood with other supporters at a Capitol news conference, along with a great group of students from Dauphin County Technical School, who will benefit if the bills pass the Senate and are signed into law. Our legislation would make it possible for more Pennsylvanians to access high-quality training and find good-paying, family-sustaining careers. Workforce development was a main focus of Gov. Tom Wolf’s budget address, and a recent survey of employers by the Pennsylvania Chamber of Business and Industry found “finding qualified candidates” to be the No. 1 concern for companies in Pennsylvania. The bills passed overwhelmingly with bipartisan support last week and are now with the Senate for consideration. After the press conference, I made comments about these important, necessary bills. Click here to view my comments. Learn more about our workforce development bills and #GoodJobs4PA here. Recently, I was appointed by Speaker of the House Mike Turzai (R-Allegheny) to serve as chairman of the Subcommittee on Career and Technical Education under the House Education Committee for the 2019-20 Legislative Session. In order to grow our economy, it is imperative that we connect our education system with the needs of job creators. The Pennsylvania Turnpike Commission is now accepting applications to fill summer positions for toll collection, maintenance, clerical and engineering employees. Toll collectors must be available to work any of the three shifts over a 24-hour period, including weekends and holidays. Employees will work a 40-hour week and will not receive benefits. All eligible candidates must be at least 18 years of age and have completed a secondary education program such as high school or GED at the time of hiring. The program is limited to 16 weeks per employee and runs between May 1 and Sept. 30. All applications MUST be submitted online at paturnpike.com/employment under the “Summer Work” selection. Copies of online applications should be sent to my Harrisburg office by Monday, April 15. To help keep harmful vaping products out of the hands of minors, the House this week passed legislation that would add “electronic nicotine delivery systems” (ENDS) to the law that currently makes it illegal to sell tobacco products to minors and, for students, to possess or use such products on school grounds. ENDS include, but are not limited to, e-cigarettes, JUULs and vape pens. While the products are touted as harmless by some, medical experts have warned that the high doses of nicotine available in many products negatively affect the developing adolescent brain, and the long-term effects of inhaling vaporized chemicals is unknown. This week, the House Aging and Older Adult Services Committee approved a package of bills designed to help seniors in need continue to receive PACE and PACENET prescription drug benefits. House Bill 754 would ensure any individual enrolled in PACE and PACENET as of Dec. 31, 2018, remains eligible if their maximum income limit is exceeded due solely to a Social Security cost-of-living adjustment. House Bill 375 would exclude the cashing of savings bonds for seniors age 65 and older from being counted towards income when applying for lottery funded programs, including PACE and PACENET. The final part of the package, House Bill 684, would remove the value of federal veterans’ disability payments and the value of all state service-connected payments from income eligibility calculations for the PACE and PACENET programs. The bills now go to the full House for consideration. How Much Do My Prescriptions Cost? The state Department of Aging maintains a database to help consumers compare the cost of frequently used medications. The cost of prescriptions for cash-paying customers can vary widely between pharmacies, as each pharmacy sets its own prices for cash payers. Patients with prescription insurance coverage will also find price shopping useful if their coinsurance is based on a percent of the total cash price. The online tool updates prices weekly, lists prices by ZIP code or distance from location, includes pharmacy store details, and lists pharmacies with low-cost generics and those that match lower prices. You can learn more about the tool by clicking here or calling 1-800-835-4080. This week at the state Capitol in Harrisburg, the House was busy considering additional legislation that is beneficial for all Pennsylvanians. Please click here for more information on the bills that were approved by the House.